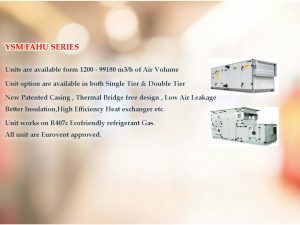 YMA FAHU SERIES Units are available form 900 - 180,000 m3/h of Air Volume Unit option are available in both Single Tier & Double Tier thermally insulated rigid enclosure , extruded aluminum profiles,High Efficiency Heat exchanger, Highly Efficient Fan etc. Unit works on R407c Ecofriendly refrigerant Gas. All unit are Eurovent approved.